One of the things that I will always be grateful for is to have finished my studies with the help of generous organizations and people. I had received financial assistances when I was during my elementary and high school days. And then I eventually got scholarships when I was in college when I studied BS in Computer Science (DOST and DLSU). Up to now, I'm still finding ways to pay that forward. First is by helping my siblings with their studies (I still have two siblings that are still studying), and then another is doing volunteer work/donations for organizations and charities here in Colorado. That is why when I was contacted about 828 Movement Bracelet and learned about their goal of supporting under-funded urban area schools, I immediately agree to take part of their campaign. August 28, 1833: Slavery was abolished in the UK, which led to American abolition. August 28, 1955: Emmett Till was brutally murdered which was a catalyst to the 1960s Civil Rights Movement. August 28, 1963: Dr. Martin Luther King Jr. delivered his “I Have a Dream Speech". August 28, 2005: Hurricane Katrina landed in Louisiana and the delayed response for relief impacted mainly black communities. August 28, 2008: Barack Obama accepted the Democratic Nomination for President. I received the bracelet via Amazon this week (thanks again for sending this, 828 Movement Team!) and was happy with the packaging and the material of the bracelet itself. The band is made of rubber material with holes to help you adjust it according to your wrist size (which I really love!). The ends are held together by a metal shaped in U. Aside from the meaning behind the product, I actually love the bracelet as it is made of rubber and can be adjusted. For someone that has skinny wrist, wearing bracelets has always been my dilemma as they look awkward on me when I wear them. But as you can see in the photo above, the bracelet looks just fine given that I was able to adjust it using the holes and metal lock. And knowing that this accessory symbolizes and actually support/help fund schools is something that I will proudly wear! 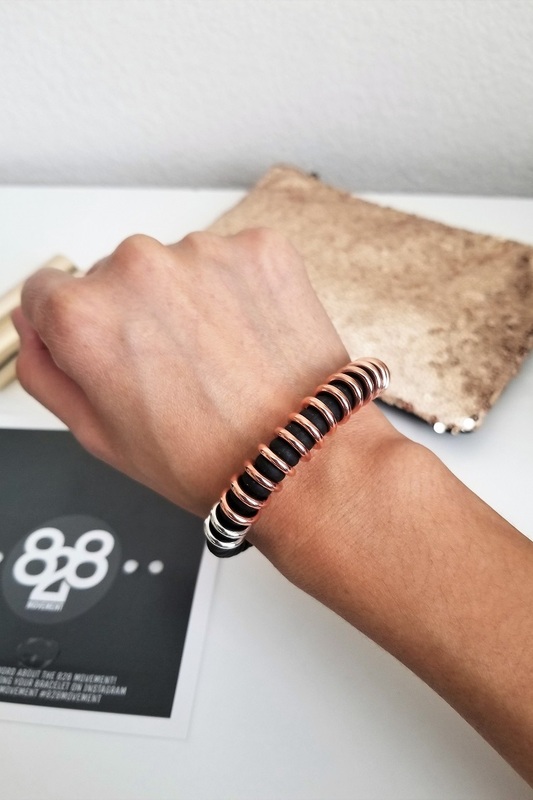 Currently, 828 Movement Bracelet is available in 4 colors: black (the one I was sent), white, blue and red. Feel free to visit 828 Movement official website to see how they look. They are currently sold out right now but will be available again by May 6. They are also available in Amazon if you want to order from there, too. And please keep in mind that all of the proceeds from these products will go toward underfunded urban schools in America. It is definitely a great gift idea to your love ones and friends, too! The giveaway will run from today until May 9 so join now and spread the love! The winner will be contacted by the 828 Movement Team on how to ship the prize. Good luck and hope you support the giveaway and 828 Movement. Have a great weekend, Budget Fashion Seekers! Hi Fashion Seekers! How was your weekend? It had been snowing a lot again here in Denver so we decided to just stay home and relax. I was a bit productive today as I was able to finally setup my new backdrop and did some test shots! It is still a bit tricky though given that I mainly rely on natural light for my photos, and the weather needs to be really sunny so as our apartment get enough sunlight. But hopefully, I will be more comfortable with this new setup soon. I am quite excited to take more self photos now! If you have been following me on my different social media accounts (especially on Instagram), this image is already familiar to you. I got this cute graphic tee from Feel Great Goods and someone who loves wearing tees with cute design, I couldn't say no to this Sushi Roll shirt! Besides, Japanese food is in my top three favorite cuisines. This t-shirt is actually very comfortable and they have XS so this fits me well. For this budget outfit, I chose to pair the graphic tee with a printed pair of shorts from Target. I can also see myself wearing it with a skirt that would match any of the colors of the shirt design. But I opted this look for a weekend of relaxing at home vibe, finishing with a ponytail hairstyle. The This is How I Roll Sushi Shirt costs US$25.00 and they have an ongoing sale right now if you check their website. 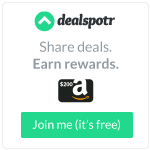 Also, being one of the bloggers for their campaign, you can use my promo code SALLY25 to get a 25% discount! Using my discount will also help me be credited with the sales without any additional charge from your end. 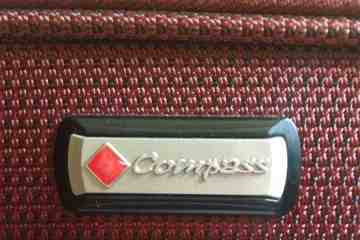 Please let me know if you have any question about this product and I will do my best to answer them. What do you think of this outfit? Please comment down below and let me know your thoughts? Have a great start of the week! Have you already heard about Becca Cosmetics? I just recently delved into the beauty category of the blogging world and I am happy to have found this brand via Influenster. Becca Cosmetics is a cruelty free beauty brand originally from Australia, but now part of Estee Lauder Companies. They makeup products ranges from foundation, powder, primer, highlighter, palettes, lipstick, lip gloss, blush, bronzer as well as brushes. And for today's post, I am sharing the products that are included in the Becca voxbox I got from Influenster: The Ultimate Lipstick Love and Ultimate Lip Definer. This VoxBox is already the second one that I got from Influenster (Thank you so much, Influenster!). Upon opening it, I thought that the color scheme of the package captures essence of the products that it contains, which are the Ultimate Lipstick Love and Ultimate Lip Definer. It is also very timely as I received this a month before Valentines Day! As you can see in the picture, the box includes two pieces of each. For the Ultimate Lipstick Love, I got the shades Dusk and Poppy, while Shades Pouty and Fun are the ones I received for the Ultimate Lip Definer. According to their website, this lipstick is “a moisturizing, 8-hour longwearing silky satin lip colour infused with the next generation of hyaluronic acid.” It is priced at 24USD and currently has thirty different shades. Upon browsing more, I saw that they have four additional shades for their Khloe x Malika Collection. I would be writing a detailed review of this lipstick soon but for now, I can say that I love the Dusk shade and I find the packaging of the product very classy and easy to use. They describe their ultimate lip definer as “a high impact, 8 hour long wear lip liner that effortlessly contours and defines the lips with the perfect balance of colour and precision.” Currently priced at 18USD, this lip product has eighteen shades available and I find the Pouty shade very good (It goes well with the shade Dusk of the Ultimate Lipstick Love). Personally, I do not use a lip liner but this product is very easy to use and long lasting. The only thing I do not like with the lip definer is the bitter taste you get when it is applied on the lips. I will write more details about this product soon on this blog as well. So seekers, what do you think of this VoxBox? Will Becca Cosmetics be a brand that you would try? Please let me know in the comments below! Share as well if you have tried any Becca Cosmetics as I want to get more insights about their brands. Have a great day! Hi everyone! It is snowing hard this evening in Denver! And since this is the appropriate weather to showcase a cold weather budget outfit, let me share with you a simple style I did with my 5USD plaid coat. Yes! You read it right. I bought this coat for 5USD (250PHP) back in Manila in 5 years ago. I think I bought this particular plaid coat after I came back from my US business trip. I was in New Jersey for four months and since the initial plan that time was I would be home before it gets cold (I arrived in Summer 2014), I was not that prepared in terms of clothing. I did buy few jackets when I was in there, but I thought, why not buy a jacket or a coat that is stylish and affordable when I get back home? Then I saw this eye-catching coat (in plaid with the colors I love) and I was so happy that it was only priced at 5USD! I can't even buy any warm coat like this here in Colorado. I even remember I got lots of compliments when I wore this during my visit in the state around 2015. And they always get surprised when I mention the price tag. So for this budget outfit, I planned on highlighting the plaid coat. To achieve this, I opted for an all white ensemble to go with it. The white top (bought from Kids Section of Target) and jeans that I got from Bench made the look very neat in my eyes, allowing the coat to pop. To complete the look, I chose to wearmyever reliable pair of gray knee length boots from Payless. What do you guys and gals think? Do you like this budget outfit I came up with (and wear it given a chance)? Please let me know by commenting below. Have a great day! PS: Don’t forget to join my current giveaway with Smile Brilliant! Please visit this post to get to the giveaway link. Thanks! Despite all the gadgets/electronics that are readily available to us, there are still a lot of areas in my life that are still on the “manual” side. I still like using journal/planner instead of e-calendar or e-planner, or using notebooks when jotting down notes during seminars instead of using a note app on my phone (unless I didn’t have any paper to write on at that time). Also, I am that type of person who uses a regular toothbrush all her life. You might ask if I have been living under a rock, but I guess it is just due to the fact that I rarely have issues with my oral health. And all this time, those regular toothbrushes that I buy from the grocery store work for me. 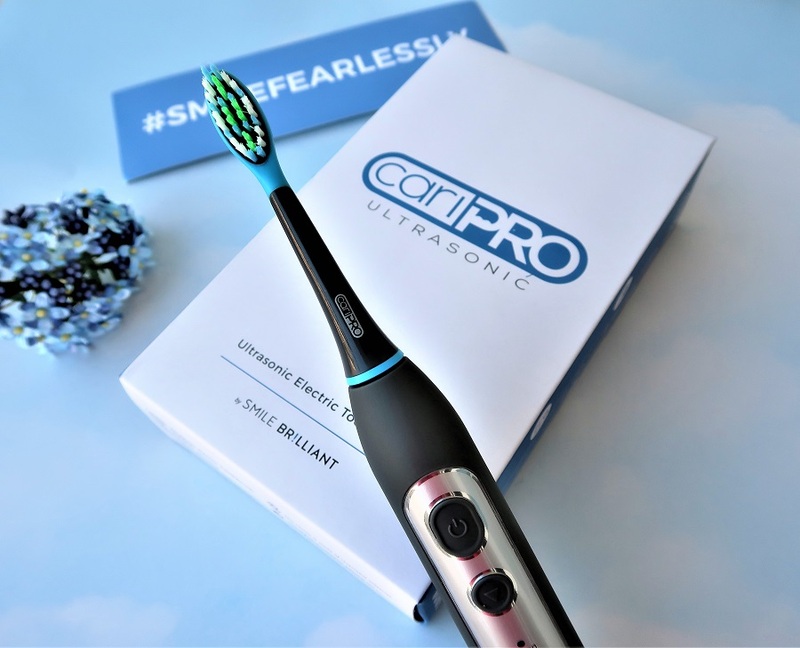 That mindset though has changed a few weeks ago when I finally tried my very first electric toothbrush: the cariPRO Ultrasonic Electric Toothbrush by Smile Brilliant! - The rubberized brush head also has built-in tongue scrubbers. The selling price of this particular kit is 119USD, with two year manufacturer’s warranty. They also offer a sixty day trial window, so you can return the product for free if you feel like it is not for you (nice to have, but I think you will end up liking the toothbrush once you tried it). They also offer international shipping, but do read the details as there are some differences based on products and the country that you are choosing. Below are the different brush modes you can use with cariPRO Ultrasonic Electric Toothbrush. Once the power button is turned on, the toothbrush will operate for two minutes, thirty seconds for each interval (with brief pauses). This is the mode that is recommended for daily cleaning. At first, I find this too much for me so I switch to sensitive mode. Given a few days though, I got used to it and now using this mode most of the time. This is the most intense among the five options, but it is meant for removing stains, polishing and deep cleaning. I use this once in a while, but make sure to give my teeth some rest so I switch to the Clean mode or sensitive depending on how my mouth feels overall. I tried using this mode alone out of curiosity, but the recommendation is to use it along with another cleaning mode (which is what I am doing after reading it in the manual). I love the relaxing pulsation that I get from this mode! This is recommended for gentle cleaning along the gumline. And like the massage mode, it is recommended to use with another cleaning mode for complete coverage. I think this is still my favorite as this is the least aggressive among the three cleaning modes. If you are also like me who is new to electric toothbrushes, I recommend that you start with this mode first, and then progress to the other two as you get more comfortable. 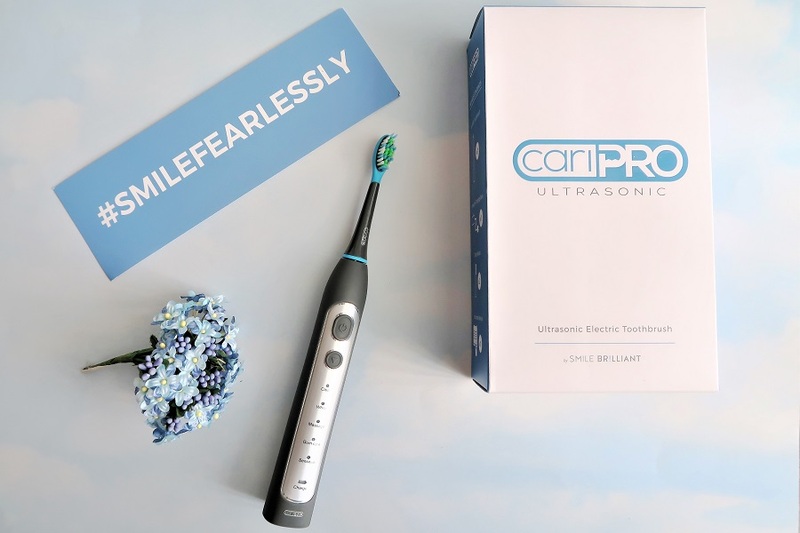 It has been two weeks since I started using the cariPRO Ultrasonic Electric Toothbrush and my teeth have never felt this clean! I thought I was doing well on how I take care of my teeth and gums with my regular toothbrush, but I was really impressed with how the feeling of having clean teeth and fresh breath went up to a different level just by switching to an electric one. You can definitely tell the difference after every use! It helped me improve my confidence especially when smiling as an effect of having that feeling of healthy teeth and gums. I also love that there are different brush modes available, so I can just switch it up depending on how intense I want the cleaning power is, or if I just want that relaxing pulsating vibration while brushing. The two-minute automatic timer also helps so you will not have a hard time knowing if it you have brushed your teeth with the recommended time. It makes me look forward to those two minutes of brushing my teeth twice a day, not feeling lazy at all just to feel that after effect of using cariPRO toothbrush. I don’t think I will be go back to using a manual one from now on! I highly recommend this product to those who wanted to try an electric toothbrush for the first time or those that want to to try something different. As for me, my next goal is to check their whitening system. I drink black tea every day for years and I know I already need to address the stain that is accumulating on my teeth. I have been reading a lot of good reviews regarding their whitening gel product, so hopefully get to try it soon. Additional fact that makes me want to try it is because it is vegan! 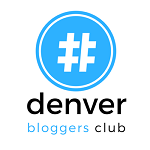 I will let you know how it goes so I hope you visit the blog regularly. Good news! 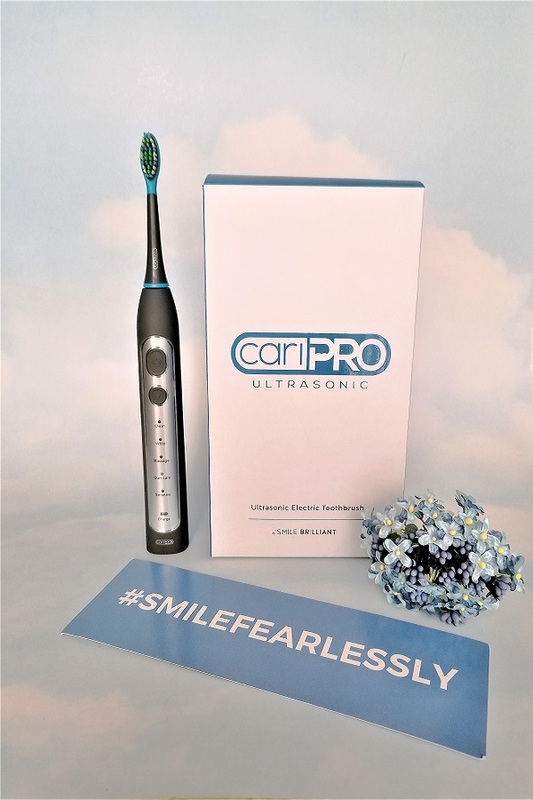 Since Smile Brilliant wants to spread the love and news about the cariPRO Electric Toothbrush, one of you can win a the same package that I got! All you have to do is click the link below and enter your name and email address. You can also get a bonus entry if you follow Smile Brilliant on Instagram. This giveaway is open to USA, UK, Australia, and Canadian residents and will close once we reach 25 entrants. Another good news! They currently have a Valentine’s Day promo that offers a 20% discount. And if ever that promo ends and you are still interested to purchase the cariPRO electric Toothbrush, you can use the discount code “thebudgetfashionseeker20” to still get that 20% off the original price! Thanks again to Smile Brilliant for introducing me to their brand and this awesome product and by giving one lucky reader a chance to try it as well. So, what do guys think? 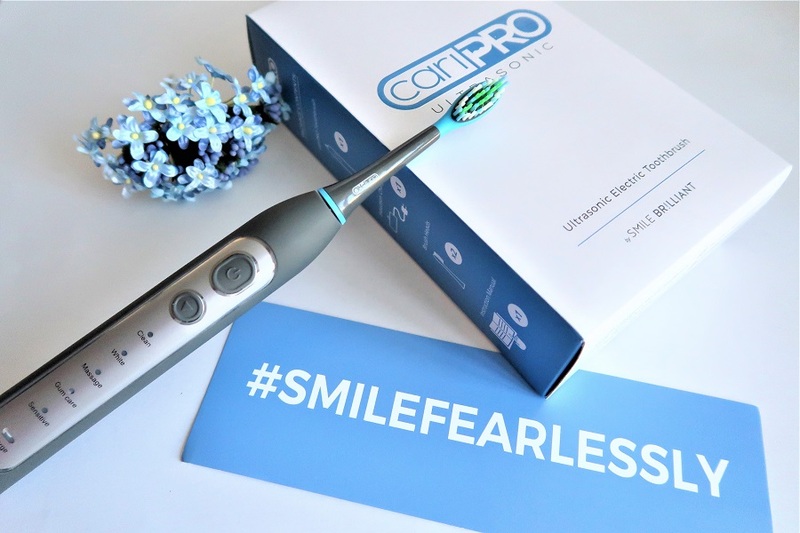 Are you now interested to try cariPRO Electric Toothbrush? Please write your thoughts in the comments section as well as if you joined the giveaway so I would know. Good luck and have a great day everyone! *Disclaimer: The product was sent to me for free, but the thoughts I shared on this post are my own.